Waiter! is typical of the works du Bois painted in the decade after his return to New York from Paris in 1906. Focusing on urban types, he was particularly drawn to society’s bon vivants dressed in evening attire and he favored restaurants and cafés as sources for subject matter. In this canvas, the man’s portly build and pompous body language as he summons his server convey the artist’s contempt for the affectations of the bourgeoisie, a common theme in his work. Though the couple is seated on a porch overlooking rolling hills and open countryside, they seem unable to relinquish their cosmopolitan pretensions. Pène du Bois exhibited six canvases at the Armory Show, and the critics responded favorably. 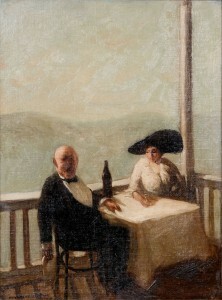 In the New York Press, William B. M’Cormick wrote that his “little canvases in the show are areek with life.” 1 The critic for the Evening Post picked up on the subtle humor evident in du Bois’s carefully observed scenes, describing them as “rather diverting little pictures” that share qualities with the American painter John Sloan’s “witty comments on contemporary life.” 2 Likewise the critic Frank Jewett Mather, Jr., described du Bois as “superior and sardonic” and praised the “characterfulness and discretion” of his work. 3 Pène du Bois offered this painting for sale at the Armory Show for two hundred dollars, but it did not sell. Receptive to trends in modern European art, du Bois was influenced by the work he saw at the Armory Show. The small, often darkly colored, carefully observed scenes that had become his trademark in during the 1900s and early 1910s gave way to larger, more stylized canvases in the late teens. He continued to focus his attention on the fashionable world of urban society, but his forms became more simplified, his canvases larger, and his colors bolder. William B. M’Cormick, “Success of International Exhibition Disproves Statements That Art is Dead,” New York Press, March 2, 1913, section 2, p. 6. “International Art,” New York Evening Post, February 22, 1913, 5. Frank Jewett Mather, Jr., “Art: The Armory Exhibition.—II,” The Nation 96, no. 2489 (March 13, 1913), 267. The American artist, educator, and critic Guy Pène du Bois began his training as a painter in 1899 in New York under William Merritt Chase. In 1902 he enrolled in a class taught by Robert Henri, who encouraged him to find his subjects in everyday life. He traveled to Europe to study in 1905. The following year he returned to New York and took a job as a reporter for the New York American that helped hone his observational skills and brought him into contact with the wide range of individuals who would become his subjects. Exploring social satire in the style of the French artist Honoré Daumier, Pène du Bois made the disdain he felt for the complacency and pretensions of the bourgeoisie a recurring theme in his work. His specialty became fashionable people in the city’s cafes, theaters, and bustling streets, which he often painted in a small format that he believed conveyed his views with more strength. Pène du Bois was a member of the Association of American Painters and Sculptors and worked hard to publicize the Armory Show. The March 1913 special issue of Arts & Decoration, the magazine he edited, was devoted entirely to the exhibition and was intended to prepare the public for what they would see. In his article “The Spirit and the Chronology of the Modern Movement,” Pène du Bois celebrated “the great modern art of the day—an art that is thoroughly imbued with the intoxicating serum of life.”  He also claimed to have ghost-written many of the articles in the issue after long and careful interviews with artists, including those by William Glackens, Robert Henri, and the Association’s president Arthur B. Davies. Pène du Bois lent six of his own canvases to the exhibition. Du Bois began writing for Arts & Decoration in 1911 and served as editor from 1913 to 1915. He moved on to the New York Post in 1916, but returned to Arts & Decoration as editor from 1917 to 1921. See Betsy Fahlman, Guy Pène du Bois: Painter of Modern Life (New York: James Graham and Son, 2004), 19. Guy Pène du Bois, “The Spirit and the Chronology of the Modern Movement,” Arts & Decoration 3, no. 5 (March 1913), 152. Guy Pène du Bois, Artists Say the Silliest Things (New York: American Artists Group, 1940), 173. Jerome Myers, Artist in Manhattan (New York: American Artists Group, 1940), 38. Guy Pène du Bois, Artists Say the Silliest Things, 174.